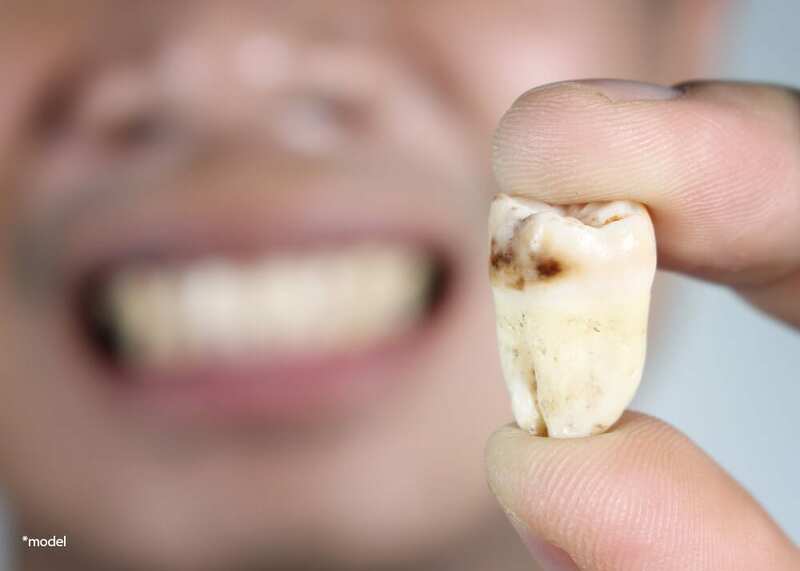 The simple extraction of a single tooth can lead to many problems, such as, the ability to chew, bone loss, problems with jaw joints and shifting of teeth, which can have a major impact on your dental health. At the time of extraction, the oral surgeon will numb your tooth roots, jawbone, and gums that surround the area with a local anesthetic. If you do feel pain at any time during the extraction, we will give you more local anesthesia to make you comfortable. Some teeth require sectioning. This is a very common procedure done when a tooth is so firmly anchored in its socket or the tooth root is curved and the socket can’t expand enough to remove it. The doctor simply cuts the tooth into sections then removes each section one at a time. There is a special type of bone surrounding your teeth. This bone is called alveolar “ridge” bone (jawbone) and exists solely to support your teeth. As soon as the tooth is removed, this bone begins to degenerate and “melt away.” The overlying gum tissue melts away with the alveolar bone and thins out as the ridge flattens. This occurs in two dimensions. The first is a loss of horizontal width caused by the collapse of the bone surrounding the dry socket. This makes the remaining ridge narrower than when the tooth was present. The second is a loss of vertical height. This makes the remaining bone less “tall.” This process is faster in areas where you wear a partial or complete denture. You have many options to prevent this, and it is important that you consider them before any teeth are extracted. Some of these procedures are best performed at the time the tooth is pulled. When you need to have a tooth or teeth extracted, whether it be due to tooth decay, fracture, abscess, gum disease or traumatic injury, a socket site preservation is recommended to preserve as much of your underlying jawbone as possible for your future restorations. Dental implants: These are root-shaped supports that hold your replacement teeth. The more bone support you have, the stronger the implant replacements will be. In some cases, the bone can degenerate to a point where implants can no longer be placed without having more complex bone grafting procedures to create the necessary support. Obviously, preventing bone loss is much easier than recreating the bone later. “Fixed bridge”: This is a restoration that is supported by the teeth adjacent to the missing tooth space. The replacement tooth (or pontic) spans across space. If the bone is deficient, there will be an unsightly space under the pontic that will trap food and affect your speech. Other replacement alternatives include removable partial or full dentures. These often perform better with more supporting bone as there is added support against dislodgement. There are two important phases in retaining your alveolar ridge during and after the tooth extraction. Non-traumatic extraction techniques are designed to preserve as much bone as possible and reduce bleeding and discomfort. In addition to non-traumatic extractions, and the key to preventing the collapse of the socket is the addition of bone replacement material to the extraction socket. There are several types of bone grafting materials and techniques. Dr. Salamati will discuss the most appropriate one with you. After the tooth is extracted, the socket will be packed with bone or bone substitute and covered with an absorbable membrane then suture. Early on, the grafting material will support the tissue surrounding the socket, and in time will be replaced by new alveolar bone. This bone will be excellent support you should choose later to have dental implant-supported replacement teeth. Although the bone created by socket grafting supports and preserves the socket, it will not do so indefinitely. Placing dental implants three to twelve months after the extraction and socket grafting will provide the best long-lasting support for preserving your jawbone and allow you to function as before. Otherwise, the graft may “melt away” or resorb over time. In some selected cases it is possible to actually extract the tooth and place the dental implant at the same time. Dr. Salamati will discuss this option with you if it is a viable alternative.